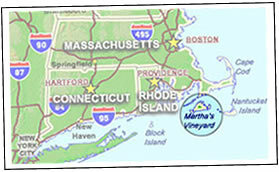 Located 6 miles off the coast of Cape Cod Massachusetts Martha’s Vineyard is accessible only by plane or boat. 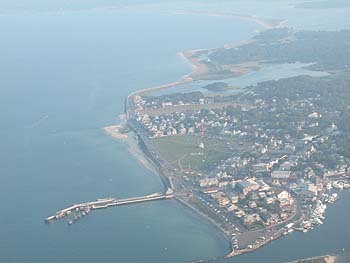 There are NO bridges or tunnels connecting Martha’s Vineyard to the mainland. The most common method of transportation to the island is by ferry. For those bringing a car the the Island, the only option is the Steamship Authority ferry departing Wood’s Hole, MA. Passenger-only ferries (most of which operate seasonally, May-Oct.) also leave from New York, NY; Quonset Point, RI; New Bedford, Falmouth and Hyannis, MA. 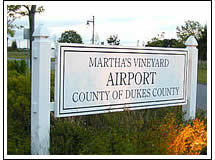 Martha’s Vineyard airport is primarily served by Cape Air and a number of charter companies on a year round basis. Cape Air flights that serve the Island depart from: Boston, White Plains, NY, Providence, Hyannis, New Bedford and Nantucket. Seasonally the airline serves Providence and Provincetown. An added attraction is their pet friendly policy. For flights to and from New York, Cape Air partners with Jet Blue for service via Boston. JetBlue and Delta also fly to and from the Vineyard non-stop from New York’s JFK Airport during the peak summer season. American Airlines service to the Vineyard departs Ronald Regan National in Washington DC. Tradewind Aviation offers scheduled flights from White Plains, NY and Teterboro, NJ. Allow sufficient time for traffic in summer months from Boston or New York especially on Route 24 or Route 3 (south from Boston) and near the Bourne or Sagamore Bridges crossing the Cape Cod Canal. Driving time from Boston to Woods Hole is usually about 90 minutes, but can double during the summer. Driving time from New York to Woods Hole is usually around 4 hours, in the summer, 6 to 7 hours is possible. Traveling south on route 128 (interstate 95) or 93 south from downtown Boston, take MA-24 S toward BROCKTON / FALL RIVER. On MA-24 take exit 14A merge onto I-495 S via toward CAPE COD. Continue along I-495 S which will become MA-25 E until you reach the Bourne Bridge. Once across the bridge you will enter a roundabout (rotary), take the second exit onto MA-28 (GEN MACARTHUR BLVD). Continue along MA-28 and go around the second roundabout, continue on MA-28 toward Falmouth, Wood’s Hole and the Islands. As your near Falmouth, MA-28 will turn one lane each way. If you plan on traveling to the Vineyard aboard Steamship Authority without your car, follow the signs posted by the Steamship Authority to an SSA parking lot with space available. DO NOT drive all the way to Wood’s Hole; you will just have to drive back to the parking lot to which you were directed earlier. If you are bringing your car across, continue along the two lane road, route 28, until you reach Woods Hole and follow the signs directing you to the Steamship Authority or Ferries to the Islands. Traveling south on route 128 (interstate 95) or 93 south from downtown Boston, take route 24 S via toward BROCKTON / FALL RIVER. At exit 12 get onto Route 140 South. Continue along Route 140 S until Exit 2E/A take I-195 East towards Cape Cod. About a mile later take Exit 15, Route 18 South/Downtown. Turn Left at 2nd light (Note: this is a left lane turn). Drive straight onto the State Pier and look for signs for Vineyard Ferries. Traveling to the Vineyard by bus from Boston is one of the most convenient ways to get to the island. The bus leaves from South Station or Logan Airport in Boston and there are numerous trips in the morning afternoon and evening. Peter Pan Lines is the only company running the route. Tickets may be purchased online or at the terminal. The bus will take you directly to Woods Hole where Steamship Authority ferries run daily to Martha’s Vineyard. Flying from Boston there are a few options, including local carriers like Cape Air and US Air Express (seasonal) as well as charter flights. For the latest information on charter flights visit our Charter Flight Section of MVOL. For the latest list of local carriers visit the MVOL airline page. Take Route I-95 to Providence, RI, in Providence exit onto I-195 East to Wareham, MA. i-195 ends at I-495/route 25, take exit for Cape Cod and the Islands, Route 495/25 East, follow across the Bourne Bridge and then follow Route 28 to Falmouth and Woods Hole. Distance from New York City – approximately 260 miles. Take I-95 N to exit 8A in Rhode Island, get off and get into far left lanes. At the first light take a left and continue until your reach the first traffic light (about 300 yards). Turn right onto route 4 south toward Quonset Point. After a couple of miles take exit 7 (Quonset Point/Route 403). Stay left at top of exit and continue on for 2 ½ miles until you pass under a very large bridge and come to a traffic light. Turn right, this is Roger Williams Way. Follow the green Vineyard Fast Ferry signs for 2 miles the ferry is located on the right-hand side. Take I-95 N until you reach Exit 20 I-195 East towards Providence/Cape Cod in Rhode Island. Forward I-195 E into Massachusetts toward Fall River and New Bedford. Take Exit 15: Route 18 South/Downtown (New Bedford). Turn Left at 2nd light (Note: this is a left lane turn). Drive straight onto the State Pier. There you will see signs for Vineyard Ferries. When coming to Martha’s Vineyard from New York City or points south on the train (Amtrak) you have two options, the Kingston, Rhode Island (KIN) stop and a shuttle or a taxi to the Vineyard Fast Ferry and Boston’s South Station with a bus down to the Wood’s Hole Ferry. 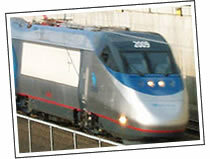 The only year round options for taking the train to Martha’s Vineyard is to travel to Boston’s South Station on Amtrak. From there you can take a Peter Pan Bus at South Station to Wood’s Hole. For more information about the schedule check out the Peter Pan website. Take the Amtrak Train to the Kingston, Rhode Island (KIN) stop. From there you can catch a shuttle or a taxi to the Vineyard Fast Ferry. For more details visit the Vineyard Fast Ferry website. Traveling to Martha’s Vineyard by bus from New York can be convenient and you don’t have to worry about parking your car. The main bus line traveling to Wood’s Hole and Cape Cod is Peter Pan Lines which departs from the Port Authority Terminal at 42 Street and Eighth Avenue. Tickets can be purchased on line or at the terminal.. The bus stops in both New Bedford and Providence making it convenient to with the fast ferries in each of those cities. To reach Woods Hole and the Steamship Authority ferry service to Martha’s Vineyard it will be necessary to change buses in Bourne. Check Peter Pan’s website for the latest times and schedules. Another option for bus travel from New York is to take either a Fung Wah or Lucky Star bus from Chinatown. These have hourly schedules to Boston where you can pick up the Bonanza Bus to Woods Hole. For flights to and from New York, Cape Air partners with Jet Blue for service via Boston. US Airways flies to and from the Vineyard during the peak summer season with service to the Vineyard departing La Guardia airport in New York. This service is also available from Ronald Reagan airport in Washington DC. JetBlue and Delta Airlines also provide non-stop seasonal service to Martha’s Vineyard from JFK Airport in New York. Follow Interstate 90 (Mass Turnpike) to Exit 11A, Route 495 South; then follow the directions above from 495. Located in North Kingstown, the Vineyard Fast Ferry terminal is only 10 minutes from I-95, 15 minutes from TF Green airport and 20 minutes from the Amtrak train station. 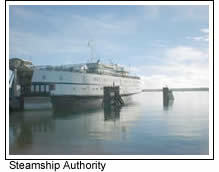 The ferry provides shuttle service to and from both hubs. Take I-95 N to exit 8A in Rhode Island, get off and get into far left lanes. At the first light take a left and continue until your reach the first traffic light (about 300 yards). Turn right onto route 4 south toward Quonset Point. After a couple of miles take exit 7 (Quonset Point/Route 403). Stay Left at top of exit and continue on for 2 ½ miles until you pass under a very large bridge and come to a traffic light. Turn Right, this is Roger Williams Way. Follow the green Vineyard Fast Ferry signs for 2 miles the ferry is located on the right-hand side. 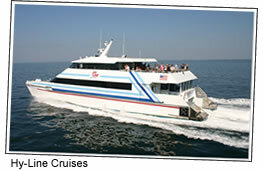 For more information vist http://www.vineyardfastferry.com. This ferry is seasonal, so make sure to check times and schedules. Take Route I-95 to Providence, RI, in Providence exit onto I-195 East to Wareham, MA. i-195 ends at I-495/route 25, take exit for Cape Cod and the Islands,Route 495/25 East, follow across the Bourne Bridge and then follow Route 28 to Falmouth and Woods Hole. Distance from New York City – approximately 260 miles. For more information about the Steamship Authority ferries and schedules or getting reservations for your car, please visit there website at http://steamshipauthority.com or call 508.477.8600. If you would like to fly from Providence there are a few options: Cape Air serves Martha’s Vineyard, as do a number of charter companies. For the latest information on charter flights visit our Charter Flight Section of MVOL. For the latest list of scheduled carriers check out MVOL airline page. May thru October: via Hy-Line Cruises (high-speed & traditional passenger ferries) and the Island Queen provide seasonal passenger only service. “The Pied Piper” serves passengers from Falmouth to Edgartown, from Memorial Day through Labor Day. Please click to view ferry page. Via Cape Air from Barnstable Airport, Hyannis MA or New Bedford Municipal airport. If you are trying to get to Martha’s Vineyard from far away places there are no direct options without first flying to New York, Providence or Boston. For more travel tips to MV without a car, check out “Hassle Free to MV“.